Since my last post, I can proudly state that the new score is, approximately, Groundhog: 146, Human: 2! Yes, those are champagne corks popping and the soft rustle of falling ticker tape you hear in the background. 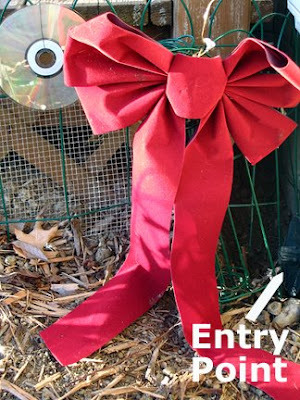 Yes, this seemingly innocuous red velvet holiday bow has stopped the digging for more days than anything else I've ever thought of, putting chicken wire, metal fencing, pepper spray, prickly branches, stacked bricks, and other obstructions to shame. Alas I cannot take credit for this brilliant offensive strategy. A wind burst in fact blew the bow off the evergreen wreath still hanging on my house, and it landed conveniently near the groundhog's preferred access point under my porch. So after hanging the intended new deterrent, the shiny CD, I decided to hang the bow as well. And, amazingly, so far so good (and I repeat, knock on wood, toi toi toi!). 2) Thursday I noticed some irises had bloomed and snapped this photo, which was supposed to be all artsy with rain droplets but was washed out in the flash. Aren't they cute? Now you're probably wondering why this is listed as a victory, but the groundhog left one flower for me to enjoy! Since one of my rules was not to eat all of anything, I'm considering it a victory. Because this is my blog and I can make unilateral decisions. Plus, I found two clumps of (as yet) undisturbed tulips. So things are looking up. 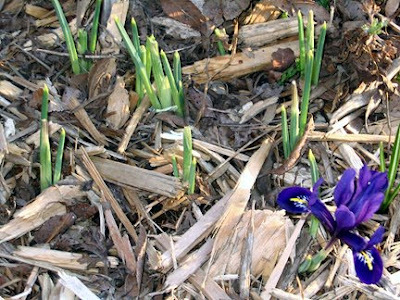 Perhaps the groundhog will continue to share and spring will finally come. Right after chocolate flows out of my garden house and faeries and leprechauns knock on my door with their pot o' gold. That's a happy accident! I hope it keeps working for you. Rabbits eat all my tulips just as they're getting ready to open. One thing that's worked for me in the past is to surround them with pruned rose canes. 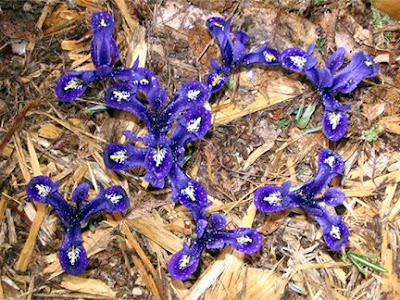 I used to cut them into three or four inch pieces and scatter the pieces on the ground around the tulips. It worked like a charm. It's too shady here to grow roses, so no tulips for me! Garden Girl, I've tried scattering pruned barberry branches (prickly) as I don't have roses. While those @#$% barberries scratch me while I'm handling them, no matter how careful I am, the groundhog simply laughs at that "barrier."